Professional organizer Brenda Prinzavalli helps create calm out of chaos. PHOTO: BRENDA PRINZAVALLI Prior to her current book, Prinzavalli co-developed The Accomplishment Journal series with one of her colleagues on the International Association of Working Mothers, for which she is national chair. 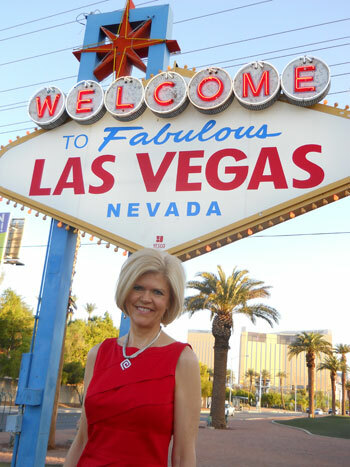 Prinzavalli is also her Las Vegas Fox affiliate's organization editor, regularly appearing on television to offer tips and advice for an orderly life. Visit her website at www.brendaprinzavalli.com. Brenda Prinzavalli didn't set out to become a professional organizer, but her friends kept noticing her effortless flair for getting things done. Naturally, they turned to her for advice. If a situation seemed insurmountable, they often asked: "What would Brenda do?" Her way of seeing the world could reassert order when life seemed out of control. Helping her friends gave Prinzavalli a new purpose, so she left her teaching career and established Balanced Organizing Solutions to help clients manage their busy personal and professional lives. With today's overscheduled families and maximum stuff acquisition, many people feel frazzled, stressed, and disorganized. Prinzavalli throws out a life preserver. "If I can help someone feel less overwhelmed and accomplish a goal—it's the greatest joy I have," says Prinzavalli, who is in the 10th year of her Las Vegas-based company, but recently released a book titled 31 Days to an Organized Life: Regain Your Sanity in Just One Month of Simple Actions. "My job isn't to come in and make it all look nice and walk away," she adds. "My job is to teach you how to apply your own personal style to your goals so you can get and—more importantly—stay organized." Organization is a universal desire, Prinzavalli explains, but a very individual process. She stresses that there's no one right way because everyone has different standards and approaches. And to her, organization doesn't just mean a tidy closet (although she can help with that, too); it's about a balanced life—one with a meaningful "to-do" list that aligns with a person's values and beliefs. Whether that's improved communication, better time management, or clutter control, Prinzavalli helps clients in both business and family settings define their organizational goals and quiet their chaos. She acknowledges that all-too familiar feeling of "paralysis" when facing a project or change: "When you get ready to start a task, your brain easily gets bombarded with thoughts and you can't make a move because you're not clear what to do first." Her book features tips for tackling an array of everyday tasks that take from 15 minutes to an hour to complete. After finishing a job, readers can record their accomplishments in a special journal space right there in the book. "At the end of the evening, women in particular tend to go through a laundry list of everything they didn't get done and go to bed feeling bad," Prinzavalli says. "It's self-defeating. I always recommend that my clients take time to reflect on the day and ask 'What am I most proud of?' or 'What did I do that was balanced or enriching?'"